Mozart / Beethoven - Ludwig van Beethoven - Mediální ohlasy - ArcoDiva management - Hudební agentura - Hudební agentura ARCO DIVA Management s.r.o. There’s no pressing logic for the coupling other than the importance and beauty of the music. 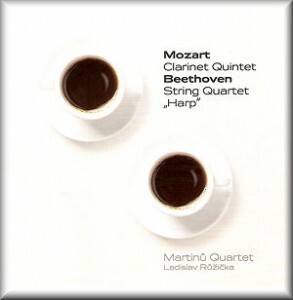 The Martinu Quartet undertakes the Beethoven Op.74 but shares the honours with the excellent Czech clarinettist Ladislav Ružícka in Mozart’s Clarinet Quintet. Therein hangs a small tale. The Martinu Quartet meets the challenges of the Op.74 Quartet head on. It’s not a frenetic performance, nor is it outsize in terms of projection. It’s clean-limbed, textually clear and rhythmically buoyant. The proportions of the first two movements remind me a touch of the Budapest Quartet’s Library of Congress recital in the 1940s, though I wouldn’t want to suggest any stylistic affinity. The Czech quartet keeps things flowing and also keeps the temperature on the cool side, locating the work’s expressive heart with aplomb. But they vest the music with sufficient introspection, where their tone is almost viol-like, to deepen and darken the slow movement. The scherzo is takenattaca, as marked, and the finale unfolds with singing control, the variations moving clearly and cleanly onwards. This is a fine coupling, and will give much pleasure.